Ambari populates many configuration settings based on the your previously entered settings and your environment. You might want to manually tune the configuration parameter settings. After you configure basic settings, you can access other settings on the Advanced tab. In Customize Services, change the Druid Metadata storage database name to druid if necessary. Select a metadata storage type. 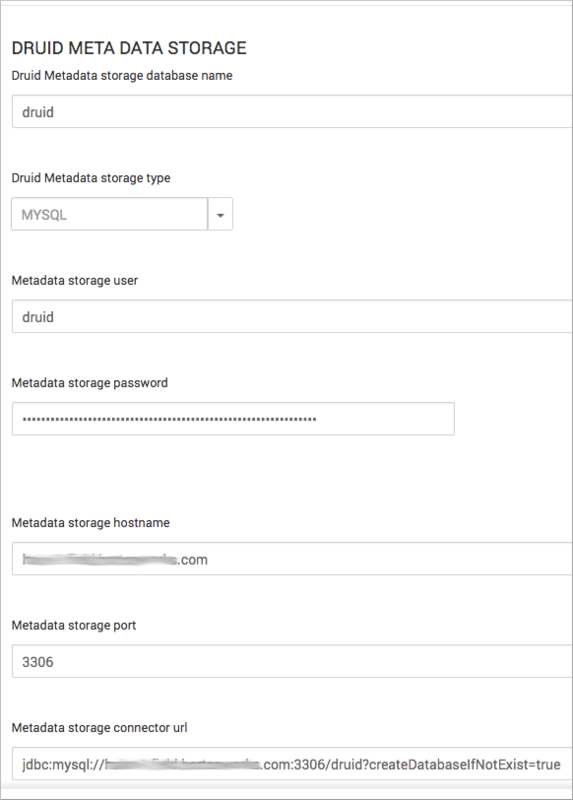 Choose a Druid Metadata storage type: MySQL or Postgres. Accept the default Derby database if you have a single-node cluster or are working in a development environment. Accept the Metadata storage user name druid, and enter the password for Metadata storage. Configure a Metadata storage host name and storage port. Enter the FQDN of the node that hosts the MySQL or Postgres database, and then enter a port number: 3306 for the MySql or 5432 for the Postgres port. Accept the default configuration values if you use the default Derby database. Address any prompts for additional configuration, click Next, and then deploy Druid. Restart any components if prompted by Ambari.